Headbands add extra detail to ponytails, up-dos and flirty hair framing the face. Stretch headbands suit short and long hair, while functioning as a fantastic way to keep hair from hanging in the eyes. Stretch headbands also pose the problem of the correct fit. Keeping a stretch headband placed on the correct part of the head, hitting at the back of the neck at the edge of the hairline and just above the forehead and behind the hairline in front, requires some preliminary steps and a little upkeep. Spray the top of your head and the back of your neck where the headband will sit on your head with hairspray. Your hair should already be styled except for the addition of the headband at this point. Only spray the area very lightly. Place the stretch headband on your head, carefully avoiding pulling hairs out of place. Pull the stretch headband about a half inch to an inch behind your hairline and above your forehead, where the layer of hair spray was applied in Step 1. Spray the area around the headband once more, applying the hairspray sparingly, focusing on the sides and the top of the head. Hairspray creates a sticky texture to the hair, which will keep the headband anchored in place for the whole day. Use bobby pins to create texture on thin or sleek hair. Start just above the ear on one side of the head and push one small bobby pin up and back into the hair to create one arm of an “X” shape. Push a second bobby pin into the hair, going across the first bobby pin to complete the “X” shape. Make another “X” shape just above the other ear. Add two more X's about two inches above each of the first X's you created. 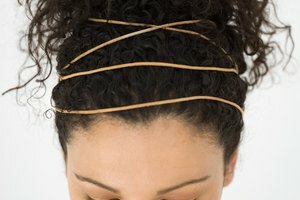 Slide the stretch headband over your head so that it sits directly over the bobby pins. The texture and shape of the bobby pins will keep the stretch headband in place. Wear a thin, 1/4 inch gripped headband just behind the stretch headband. This style of headband will include a gripped texture or tiny teeth which will connect with hair and create a barrier that will keep the stretch headband from sliding back on the head. Place the thin, gripped headband on your head, just behind the area you would like the stretch headband to sit. Apply the stretch headband directly in front of the grip headband to keep the headband in place. Pulled back hair often encourages stretch headbands to slide back on the head. If you have trouble wearing stretch headbands, try wearing them with your hair down, to encourage the headband to stay in place. What Is the Difference Between a Wave Cap and a Do-Rag?